The following people are the faces behind the Last Ocean blog. Peter Young has been working on The Last Ocean since 2006 and spearheaded the founding of The Last Ocean Charitable Trust in New Zealand. Peter is one of New Zealand’s leading documentary filmmakers with a strong background in natural history, wildlife, and arts documentaries. He has worked for most of the major players in the documentary field, including National Geographic, Discovery, BBC and Television New Zealand. 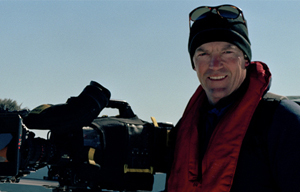 He has credits in over a hundred documentaries filmed in New Zealand and around the world and has won many awards for both his camera and producing work. He is currently working on a Last Ocean feature documentary. Cassandra has worked in marine science and public outreach for more than a decade. Her writing and research focuses on marine resource exploitation worldwide, from New England Rivers to the remote reaches of Antarctica. During her graduate work at Moss Landing Marine Laboratories, Cassandra studied the life history of the Antarctic toothfish. She has worked in the lab, underwater, and at sea and has presented her work at conferences both nationally and internationally. Cassandra is a recent graduate of the University of California, Santa Cruz Science Communication Program and writes regularly on environmental and marine topics.